Since end of 2015 the new ASMEC products with the name ZHN are part of the product portfolio of the ZwickRoell GmbH & Co. KG in Ulm. ASMEC is further your service partner for all instruments of the UNAT type. 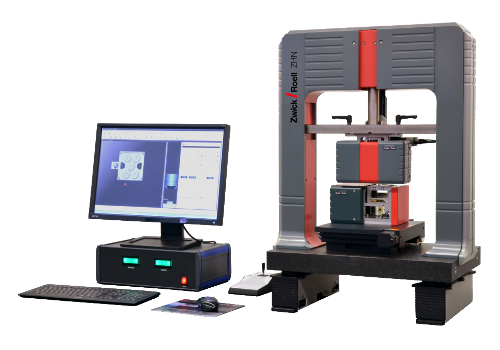 The Universal Nanomechanical Tester ZHN is an enhancement of the proven ASMEC technique that was sold under the name UNAT. Very stiff frame construction where the indenter axis is below the axis of the Z−stage for height adjustment of the traverse. Therefore no tilting effect may happen when the force is applied. Modular concept where the measuring heads for different force ranges (0.2 N; 2 N; (soon) 20 N) can be exchanged by the user without difficulties and by using the same plugs. Unique patented Lateral Force Unit (LFU) enables very precise measurements of lateral force−displacement curves, which cannot be done with any other instrument. This allows for instance the investigation of the lateral contact stiffness or of stick−slip effects in friction tests and much more. The combined application of both heads allows a better reconstruction of the loading conditions in an application in the laboratory. Large travelling distance of 70 mm in Z direction (height), so that high samples can be measured. Without the second measuring head (LFU) even samples with a height of 20 cm and a length of 50 cm can be installed and measured. The large available space gives enough room for additional installations. Unique optics with a maximum magnification of 3250x (76 nm per pixel) and two cameras for different magnifications without the need of turning a turret. This gives a high positioning stability. Unique tip check module for the daily instrument check for instance within a quality insurance system. It is using a permanently installed fused silica sample on a separate place so that no sample has to be exchanged. The software saves in a database where measurements have been done. 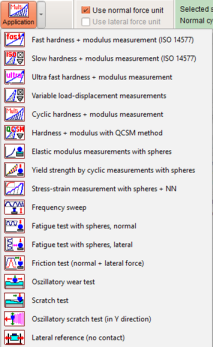 Very precise routines for the determination of the area function or the radius function for a spherical tip and the instrument compliance function (not only a force independent value is used). As the only instrument it allows the calibration of the area function with two different materials at once to exclude any material dependency. A precise optional dynamic module enables the superposition of oscillations up to 300 Hz and the measurement of amplitudes and phase shift. The continuous or quasi−continuous contact stiffness measurement allows a depth dependent measurement of hardness and modulus already for depths of only 10 nm. One−of−a−kind is the large amplitude range of more than 50 mN force amplitude so that the instrument can be used for fatigue tests.